Get free Workplace Safety Policies along with a Hazard Communication Program Package to download, customize and print for your business. (Acquired Immune Deficiency Syndrome) virus. Workplace Violence Prevention Policy – Sample general policy for violence in the workplace prevention. 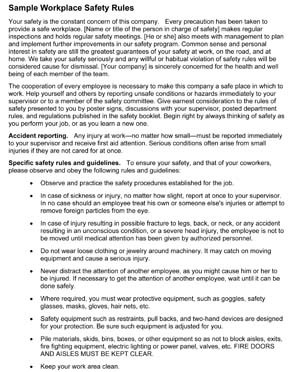 We also have the sample Hazard Communication Program Package below which includes a number of great items including the MSDS (Material Safety Data Sheet) to download and customize for your small business. If workers are exposed to hazardous materials in your workplace, you are required by OSHA (Occupational Safety and Health Administration) to have a written Hazard Communication Program. The program has to include a list of hazardous materials that are known to be present in your workplace and a completed MSDS for every chemical on the list. Also it must include a method that you will use to inform your employees of the hazards associated with the chemicals and the procedures to be followed with respect to labeling the chemicals, updating Material Safety Data Sheets, and training your employees. The program package contains two documents that is designed to help you comply with the requirements above. 1) A model written Hazard Communication Program sample to use or modify to create your own program for your small business. 2) OSHA Form 174, the basic, non-mandatory format developed by OSHA for completing the MSDS for each hazardous material on your company’s list. We also have the sample Emergency Instructions for you to use to have your employees read and have available in the unexpected event of an emergency in the workplace.